WATERLOO – A team of Wilfrid Laurier University economics students at the Lazaridis School of Business and Economics will compete in the finalist round of The Governor’s Challenge national competition. The competition, which challenges teams to simulate the role of monetary policy advisor to the Bank of Canada’s Governing Council, takes place at the Bank of Canada’s head office in Ottawa on Feb. 13, 2016. Students analyze and forecast economic developments to recommend whether to raise the bank’s key interest rate, lower it, or leave it unchanged – in order to keep inflation low and stable and in line with the two per cent inflation target. The teams then present their work and recommendation to a panel of Bank of Canada judges, who evaluate the teams on the substance of their analysis, the quality of their presentation and evidence of strong teamwork. The competition began Nov. 27 with the first round of presentations judged over video conference. Over 100 undergraduates from 22 universities across Canada participated. 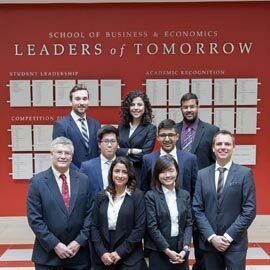 The Lazaridis School team, consisting of Jacqueline Beadman, Marc Dillon, Olivia (Jieheng) Ding, Farah Omran, Aarish Shah, Mohit Verma and Sungmin Yoon, worked with their faculty coaches and economics professors, David Johnson and Christos Shiamptanis. The Governor’s Challenge enabled the students to build on concepts learned through their economics courses, marrying theory with a real-world problem. Laurier will compete against four other finalist teams, including the University of Saskatchewan, University of Toronto, McGill University and St. Francis Xavier University. The winning team will be crowned The Governor’s Challenge National Champions and will be presented a trophy by Governor Stephen S. Poloz at a special award ceremony.